Formula One fans love speed and technology, which is why they admire F1 Racing so much. With the Formula One 2011 already started, there are lots of fans who might not be watching live races because of their busy schedules. But there is one good news, wherever you are, you can not get the latest updated of Formula one 2011 on your mobile phone directly. 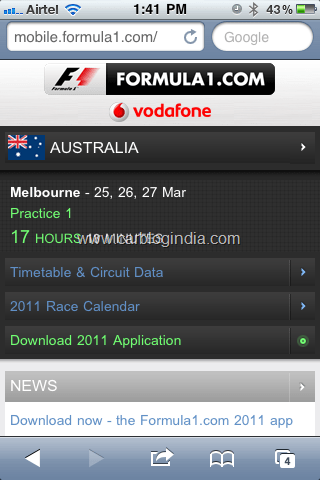 There is an app for almost all the smartphone platforms available from Formula one official website. These apps are available for iPhone, Android phones, Blackberry Phones, Nokia phones which run Java apps, Samsung, LG, and all major mobile phones which support JAVA based J2ME applications. The icing on the cake is that the apps are absolutely free and you don’t need to shell out even one penny to install these apps on your phone. Once installed, it will get you all the latest happenings, races, details and news on the go for FREE. NOTE: There maybe data or internet charges levied by your mobile phone operator, check with your mobile service provider for data plan charges if you are not aware of them. 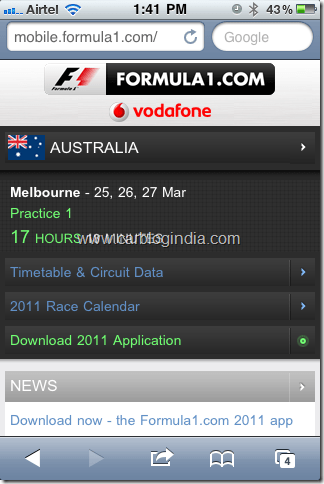 Above is the snapshot of how the mobile website for Formula 1 looks like.